On one cloudy full moon Halloween night I was out trick-or-treating with my sister and my father. There wasn't a moment that I wasn't smiling except when we got the old 2 story house on the right side of the street. My sister went up to the door and rang the doorbell. That instant a loud bark rang out from every corner. Suddenly the lights flickered on and then failed to stay on and the inside of the house was completely dark. The dog continued to bark. I looked into a window to see nothing but darkness and something red and glowing coming from the kitchen. I stared into those glowing eyes to see that that wasn't a natural eye color. I turned away from the window and walked away. As soon as I got on asphalt the barking stopped. A few months later my friend Jenna moved into the neighborhood. And then another family moved into the 2 story house. Jenna went to help the family unpack and discovered that the basement was filled with every kind of bone imaginable! 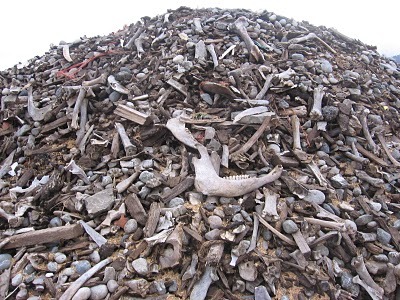 But the one thing that caught her eye was a pile of dog bones.